Uniform Study: Thoughts on Red Tait Jackets. While most reenactors associate red trim with the artillery branch of service, evidence suggests the Confederate QM often didn’t concern itself with such distinctions. There are two extant Peter Tait jackets with red trim. First, and best know, is the jacket of Private B.S. Pendelton. (Pictured to the right) Pendleton served in the 2nd Virginia Infantry of the Stonewall Brigade and also as a courier to Gen. Thomas J. “Stonewall” Jackson up until the general’s death in May of 1863. 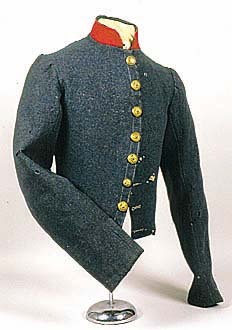 This jacket survives as it was the garment worn home from Appomattox by Private Pendleton. A second red-trimmed jacket with provenance to ANV infantry resides in a private collection in Virginia. Additional details were unavailable at the time of this writing. As a side note, this image is part of a series of three taken by Roche. Interestingly, in one image, the photographer inserted an artillerist’s sponge-rammer but removed it for the remaining two images. 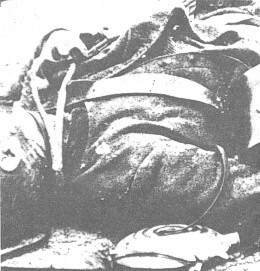 As we all know, Civil War battlefield photographers often added additional gear to images of the fallen and it is interesting that, in this case, a prop was added and then removed. One might conclude the photographer added the prop, determined the deceased to be an infantryman, and removed the prop for subsequent images.